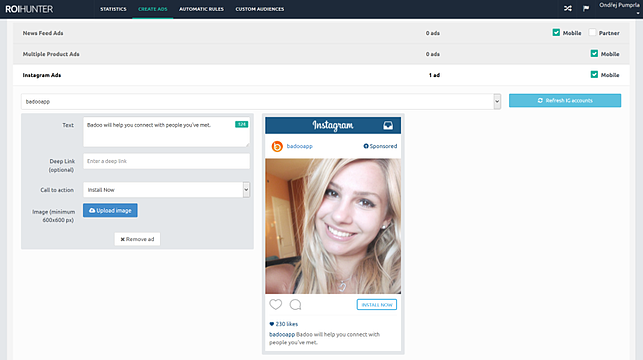 TL;DR We are glad to announce the introduction of Instagram Ads into our platform. Starting yesterday our clients can use them for several countries. Lets take a look at this newest feature and its huge potential. Instagram is an extremely popular service. With more than 300 million users, Instagram is one of the world’s largest mobile ads platforms. The possibility to advertise on Instagram has been limited to just a handful of clients – now this has slowly changed with the selected Marketing Partners being able to integrate Instagram Ads into their platforms. We in ROI Hunter are happy to be one of those few chosen companies! Instagram ads are now another placement option for selected customers. So next to Newsfeed, Carousel ads and RHS ads you will have the option of Instagram. The targeting is almost identical to normal Facebook targeting – so you can choose to target by demographic data, interests, and more. You can even use Custom Audience or Lookalike Audience! How to create Instagram Ads in ROI Hunter? It is really easy! One of the main differences between a normal post on Instagram and an ad is the CTA button. At this moment there are couple of options: Link Ads (Learn more button, Website clicks as an objective), Video Ads (Video views objective) and Mobile App Installs Ads (Install now button and Installs as the objective). For now you can only target these countries: USA, Canada, UK, Germany, France, Brazil and Australia. Some of the well-known rules from FB Ads apply (max 20% text, no mention of FB, relevant content etc. ), some are Instagram-specific. Even though you can now use other formats than square on Instagram, for ads square format is required. Max caption length is 175 characters and you’re not allowed to use borders. With the great engagement brands appreciate on Instagram (and no filtering of the Newsfeed), we believe Instagram Ads will be a great fit for our creative e-commerce clients. Want to showcase your great fashion items? Tell your potential audience about a new app? Deliver 15 seconds of driving pleasure? Contact us and learn about the great potential Instagram ads AND ROI Hunter might offer. Because – we don’t stop here! As the deep links are possible, we still continue our mission to help you connect all the data you have – and this also means the great possibilities to measure the ROI of your new Instagram ads! See you on board – contact us for a free trial! The possibility to advertise on Instagram has been limited to just a handful of clients – now this has slowly changed with the selected Marketing Partners being able to integrate Instagram Ads into their platforms.